Whether it is a wedding, birthday, office party or a naming ceremony, organising a party is very exciting. However, once the initial exuberance wears off and reality sets in, you are left with a mountain of tasks to pull off. From choosing the date to the venue and guest list and from food to entertainment, the tasks appear never-ending. There is much to do and more often than not, very limited time to get all in line. At the half-day workshop that begins at 9 a.m. participants will be taken through the entire planning process which includes making the guest list, types of venues, choosing the right vendors, catering, photography, videography and more. "Developing a plan ahead of time and taking various factors including budget and convenience into consideration makes the job much easier," says Melo who has been organising weddings for local and international guests since 2001. His client log reads of who's who and one has to book at least a couple of years in advance to have him plan your wedding. A graduate of St Xavier's and Dempo College, Melo's fascination for elaborate wedding celebrations resulted in Weddings N Dreams, one of the most well established wedding planning companies in India, known for its meticulous attention to detail. About the itinerary of the workshop, he says: "I will also be covering the topic of mind-mapping and gent cards which help in bringing out creativity and memorising lists which is very important while planning a party. 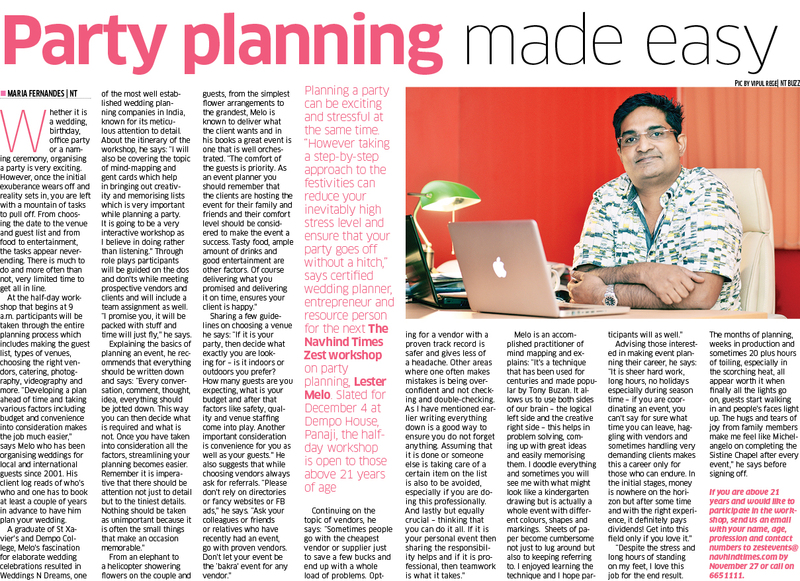 It is going to be a very interactive workshop as I believe in doing rather than listening." Through role plays participants will be guided on the dos and don'ts while meeting prospective vendors and clients and will include a team assignment as well. "I promise you, it will be packed with stuff and time will just fly," he says. Explaining the basics of planning an event, he recommends that everything should be written down and says: "Every conversation, comment, thought, idea, everything should be jotted down. This way you can then decide what is required and what is not. Once you have taken into consideration all the factors, streamlining your planning becomes easier. Remember it is imperative that there should be attention not just to detail but to the tiniest details. Nothing should be taken as unimportant because it is often the small things that make an occasion memorable." From an elephant to a helicopter showering flowers on the couple and guests, from the simplest flower arrangements to the grandest, Melo is known to deliver what the client wants and in his books a great event is one that is well orchestrated. "The comfort of the guests is priority. As an event planner you should remember that the clients are hosting the event for their family and friends and their comfort level should be considered to make the event a success. Tasty food, ample amount of drinks and good entertainment are other factors. Of course delivering what you promised and delivering it on time, ensures your client is happy." Sharing a few guidelines on choosing a venue he says: "If it is your party, then decide what exactly you are looking for - is it indoors or outdoors you prefer? How many guests are you expecting, what is your budget and after that factors like safety, quality and venue staffing come into play. Another important consideration is convenience for you as well as your guests." He also suggests that while choosing vendors always ask for referrals. "Please don't rely on directories or fancy websites or FB ads," he says. "Ask your colleagues or friends or relatives who have recently had an event, go with proven vendors. Don't let your event be the 'bakra' event for any vendor." Continuing on the topic of vendors, he says: "Sometimes people go with the cheapest vendor or supplier just to save a few bucks and end up with a whole load of problems. Opting for a vendor with a proven track record is safer and gives less of a headache. Other areas where one often makes mistakes is being overconfident and not checking and double-checking. As I have mentioned earlier writing everything down is a good way to ensure you do not forget anything. Assuming that it is done or someone else is taking care of a certain item on the list is also to be avoided, especially if you are doing this professionally. And lastly but equally crucial - thinking that you can do it all. If it is your personal event then sharing the responsibility helps and if it is professional, then teamwork is what it takes." Melo is an accomplished practitioner of mind mapping and explains: "It's a technique that has been used for centuries and made popular by Tony Buzan. It allows us to use both sides of our brain - the logical left side and the creative right side - this helps in problem solving, coming up with great ideas and easily memorising them. I doodle everything and sometimes you will see me with what might look like a kindergarten drawing but is actually a whole event with different colours, shapes and markings. Sheets of paper become cumbersome not just to lug around but also to keeping referring to. I enjoyed learning the technique and I hope participants will as well." Advising those interested in making event planning their career, he says: "It is sheer hard work, long hours, no holidays especially during season time - if you are coordinating an event, you can't say for sure what time you can leave, haggling with vendors and sometimes handling very demanding clients makes this a career only for those who can endure. In the initial stages, money is nowhere on the horizon but after some time and with the right experience, it definitely pays dividends! Get into this field only if you love it." "Despite the stress and long hours of standing on my feet, I love this job for the end result. The months of planning, weeks in production and sometimes 20 plus hours of toiling, especially in the scorching heat, all appear worth it when finally all the lights go on, guests start walking in and people's faces light up. The hugs and tears of joy from family members make me feel like Michelangelo on completing the Sistine Chapel after every event," he says before signing off. If you are above 21 years and would like to participate in the workshop, send us an email with your name, age, profession and contact numbers to zestevents@navhindtimes.com by November 27 or call on 6651111.